Many modern brides living in the age of female empowerment aren’t waiting for prince charming to pop the question — they’re taking their happily-ever-afters into their own hands. Danielle Sinay, emboldened by the women’s movement, asked her boyfriend of three years to marry her in October. “Knowing it’s accepted and seen as something positive opposed to a flaw, I felt a lot better doing it,” she said. Planner Ash Fox is staging a proposal next week for a female client asking her boyfriend for his hand in marriage. Reed refused to get on bended knee. 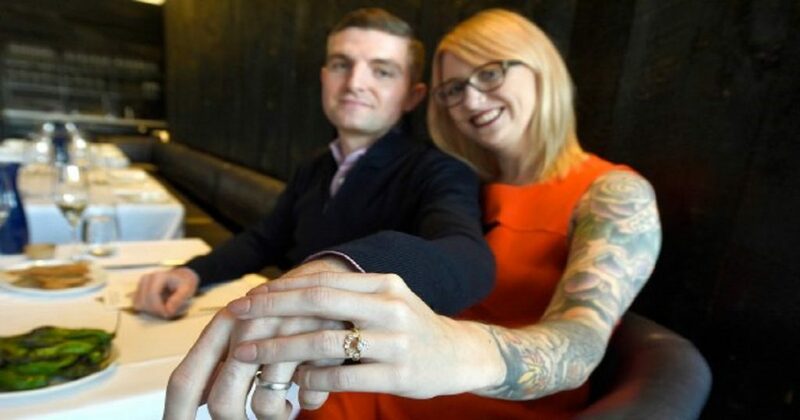 Instead, the 34-year-old wedding photographer and her 36-year-old fiancé, Steven Jauch, had just finished dessert at Grand Army in Boerum Hill when she slipped a card across the table. “In case you don’t want to be single Steve anymore,” he read from the note inside as Reed pulled out another surprise — a titanium engagement band she ordered off Amazon for $10. Their waitress brought congratulatory champagne and Reed snapped a photo of her ringless hand atop her new fiance’s. On social media, they posted engagement photos tagged #hesaidyes, a hashtag they learned is typically used by gay couples and high school girls asking guys to prom. When asked if the proposal was a blow to his masculinity, Jauch told The Post he was envious that Reed got to do the asking, but that his ego is just fine. The Astoria couple plans to marry in October in the Appalachian Mountains in North Carolina. Reed has since gotten an engagement ring – one she designed herself. Wedding planner Jesse Reing, of Events By Jesse, who has two female clients who proposed to their grooms, thinks the growing economic equality between men and women is a factor behind the engagement trend. Even for women saying time’s up on patriarchal customs, some struggle to shake the pressure to have a traditional engagement. Sinay, a 26-year-old Brooklyn-based writer who did not want to give her full name, said that despite being a “devout . . . feminist,” she still felt a twinge of embarrassment proposing to her boyfriend at a Brooklyn bar last year. “I hate this, but I felt like I was not a real bride and that people wouldn’t take me seriously as an engaged person,” she said. But waiting to propose would have been worse.